1. Blend together the red wine, oil, garlic, Worcestershire sauce and paprika. Add the lamb. 2. Cut the courgette into 12 thick slices and add the pieces to the marinade with the whole mushrooms and the pepper pieces. Cover and leave the ingredients for 1 hour to marinade. 3. Drain the ingredients reserving the marinade for basting. Roll the strips of meat up then thread them onto soaked bamboo skewers with the other ingredients starting and ending with lamb. 4. 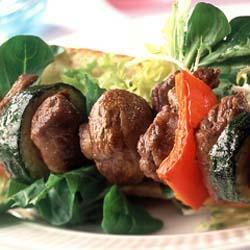 Grill or barbecue the kebabs for 10-15 minutes turning and basting them frequently with the reserved marinade. 5. Serve the kebabs on halved pieces of French bread covered with mixed green leaves of salad.